Tents need to be broken down and it is 503 miles of driving from this Desert of Ahhhs to my home, also in the desert, although one entirely different. Mike and I get an early jump and decide to squeeze in one last quick descent about five miles into the drive. Morocco Canyon fits the bill perfectly. Not a whole lot to report really. The approach is 20- minutes, beautiful and requiring the right line to make it through. The canyon itself is varied, simultaneously easy and exciting. A few waders chilling us on this early morning before the sun’s remedy. In under two hours we are back to the car snaking on slick rock before the 498 miles left of the drive. Another Spring trip is one for the books. David looks on into Morocco Canyon. 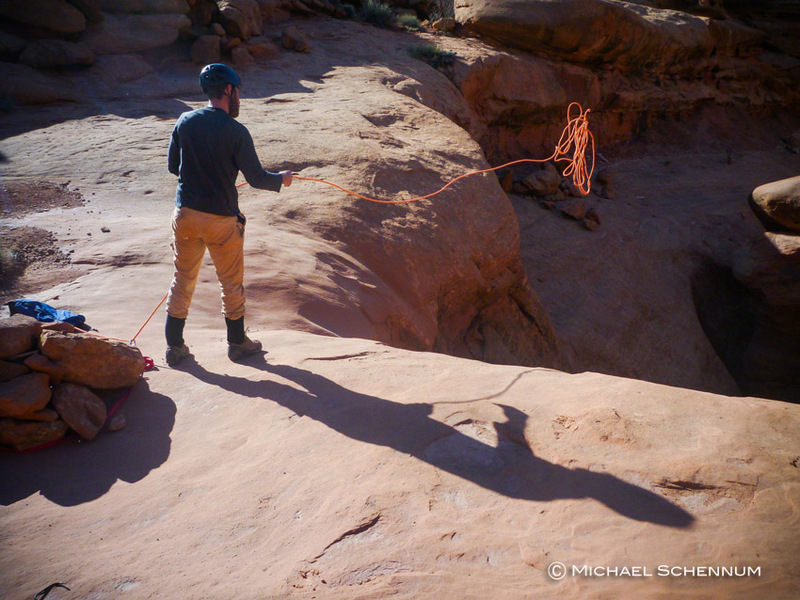 David tosses the rope while setting up for the first rappel of the canyon. Mike passes under the arch in Morocco Canyon. David wades in chest deep water. David uses a hand line for a down climb. David traverses a ledge near the end of Morocco Canyon. 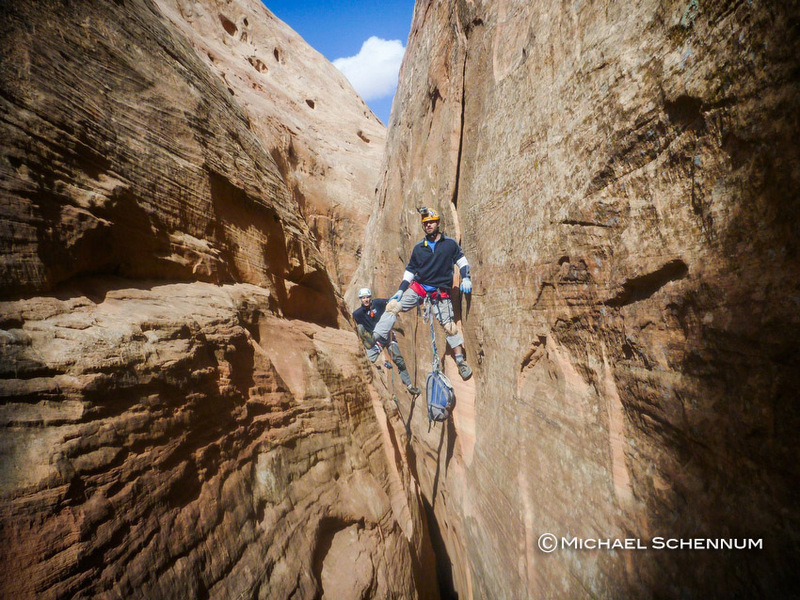 For years I have heard Mike and Eric talking about a desire to descend Sandthrax Canyon. They were smart about it. They didn’t just rush into it. They worked their way up, starting with easier high-stemmer canyons. I joined them on these descents. It became clear that I was not going to graduate to that next level of an “X-Rated” high stemmer canyon like Sandthrax. No doubt, my skills were not at their level, but even more importantly I didn’t seem to enjoy the high stemming style of canyoneering as much as Mike and Eric. I would continue to descend these canyons to a moderately challenging level (R-Rating) such as Raven, Inferno, Limbo, Happy Dog, Stair, and the Hogs, but wasn’t interested in taking the risks required in a canyon like Sandthrax relative to what I got out of it. Maybe one day this will change, but for now, it was a canyon I would respectfully leave alone. This is the first ever post on this blog, of a canyon that has not been descended by either myself or Laura. Through all of their anticipation, planning and discussion and after descending Sandthrax Canyon safely, joining in their celebration, I felt somewhat part of the experience, even though I wasn’t there. For this reason, I wanted Mike to share his experience on this blog. Below is his trip report. – Climber Hayden Kennedy on his decision to chop the bolts of the Compressor Route on Cerro Torre in Patagonia. Passing by Sandthrax Campground on past canyoneering trips I would usually say, “We should do Sandthrax,” to my partner, Eric as we drove by. We frequently made up excuses; not having the right gear, the right practice, the right experience. This year we finally ran out of excuses. I was climbing really strong, and Eric was in great shape, canyoneering regularly. Both of us had done high stemming canyons so we kind of knew what to expect. As we finalized our plans and strategy, including borrowing two #6 cams from climbing partners, we added Cody at the last minute to our team. We arrived in North Wash in mid-march with really great weather, it had been a mild winter after all. After doing the Hog Springs canyons on the first day, I felt pretty good. The canyons had great friction, and most of it was skinny and clean straight forward stemming. However, the next day in one of the Poison Spring Canyons I had let go of the rappel rope for the last couple of feet (a weird habit I had developed in the last couple of years) and landed on a pointed rock. My foot bent forward, and twisted. I ended up hobbling out of the canyon, and back at camp put it on RICE. By the next morning my ankle felt pretty good, but the weather had turned. We woke to wind with clouds moving in. After hanging out at camp for hours, we felt the weather was starting to turn for the better. We walked to the head of Sandthrax under a light drizzle. Never-the-less, we got to the start, and immediately began down climbing. We quickly arrived at the first rappel, but instead of a sling around a chockstone, we found a shiny 3/8” bolt. After the rappel we got in stemming position, Cody in front, Eric second and me last. I was going pretty slowly, I had slipped on a down climb into the canyon, and was feeling kind of shaky. After stemming a bit we came to the nose up climb. It looked like a strenuous squeeze chimney up climb to me, but Cody face climbed it further up canyon with a stem to a back wall. He made it look easy, so I followed, but Eric opted for the more secure chimney. It was all stemming past that, which was pretty enjoyable. The walls had features and nubs that made for pretty secure footholds. We soon realized that the major worry was gear falling out of our packs. They were getting really damaged from the canyon, and a hole could send all of our stuff into a black hole. Eric’s pack was shredded from past trips, so he clipped everything in his bag together. We continued and came to the first major obstacle. It was a climb up that looked like to me like an off-width that turned into a chimney. You could bypass the off-width, but would have to cross a silo to do so. We chose to drop down and do the off-width. I took the lead, since I had the most climbing experience. Jamming my left foot into the crack and my right leg knee barred outside I scooted my way up. It was strenuous; it definitely felt like real rock climbing. I kept moving and finally made it to some chockstones that I could stand on. We decided I would bring all the backpacks up on the rope. I started hauling as fast as I could, but still they became stuck right below me. I cursed Eric’s bag, which was the culprit. I down climbed to the bags, freed them one by one, and then climbed back up. Right after this we came to the silo. It was really exposed and looked to be hands on one side, feet on the other, looking straight down while you stemmed it. A shiny bolt with rings, right above the original piton, protected this. After creating a mess with personal anchors, slings and backpacks on the single bolt, we reorganized and I was itching to climb. I stemmed down, back to feet, and switched over so my left foot was on the left wall and right foot on the right wall. As I walked forward I switched again so my feet were on one wall and my hands were on the other, with me looking face down. I quickly realized that this was totally unnecessary. I could easily do the splits and cross the silo. As I switched around, I heard something ping-pong down, and saw my Nalgene careen into the dark hole in the silo. In my eagerness to climb I had forgot to close my bag, and was lucky to only lose my water and not that crucial #6 cam. Across the silo, which although exposed was really easy, there was a second 3/8 bolt, with a rap ring on it. I tied the rope to it, and Eric and Cody created a safety line. Eric, being shorter, used the line, and then Cody came across with a belay. It was more for mental confidence for Cody, for if he fell, he would take a wild swing through the canyon and probably hit his head. We came to the crux. I had originally wondered how I would belay from the top, but saw that there was a bolt above the off-width, with 5 or 6 links of chain hanging from it. We took a break and ate, and pulled out the gear. Eric and I had practiced aid climbing two weeks before at the local crag, so I felt somewhat confident. I attached one etrier to each #6 cam. Then I used personal anchors to attach the cams to myself. I started aiding, taking my time. Slowly I arrived at the top. After stepping up, then backing down, and repeating that a few times, I realized I would have to stick my foot in the top rung of the etrier and stand up. When I tried to do this my foot would swing unsteadily into the crack. I finally placed an arm bar into the crack and stood up trusting that I wouldn’t get spit out. I made it close enough to the chain, grabbed it, and walked heel toe sideways to a safe spot. I fixed a rope and Eric and Cody bat manned up. While they were doing that I noticed someone had bolted a cold shut higher up, above the chain. “Why would someone do that?” I thought. After more stemming we came to the next rappel. There was a hueco, with slings around it, but it was backed up with a drilled piton below it. Also there was a long fixed rope hanging from it. I made a quick decision to clean it up by chopping the sling from the hueco. I took the rappel ring, which was a heavy-duty steel kind, and also took a locking biner from the piton. Cody produced a quick link and we attached it to the piton. I collected the rope and put it in my pack. As we neared the finish we could see a long green rope trailing down the canyon. We came to a bolt that was screwed into the rock with webbing around it. A hex was tightened on a cordelette. We weren’t sure why it was there, the climbing at that point was very easy. I unscrewed the hex and took it, along with the cordelette and a heavy-duty quick link. 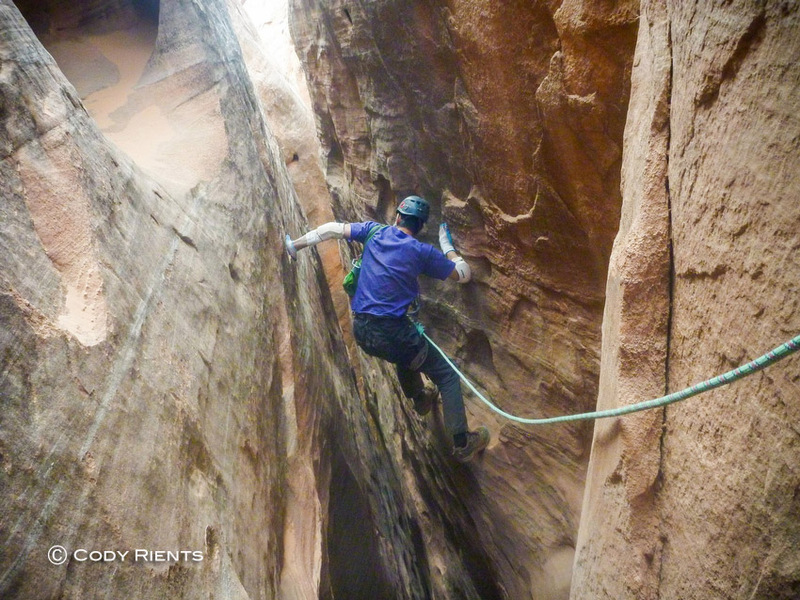 Eric stemmed down canyon, collecting rope as he went. We came to the final elevator, which I was happy to see, because at this point I was pretty tired. After high-fives and a group photo we walked back to camp with plenty of daylight. Cody even did another canyon right after, a solo no less! In all we took out 265’ of rope, as well as miscellaneous hardware. The new bolts didn’t really make the canyon all that much easier or safer, but it did take some of the adventure out of it. Because they were there in a few situations we used it, but I still wish they weren’t. Evaluating and creating natural anchors, crossing the easy silo on a piton, aiding out of the off width into the chimney without the chains, its exciting, it’s the reason we go out into the desert. We canyoneer for the adventure, and when the experience becomes watered down, then what are we doing out there? This sport has risk, its inherent, but we take what we feel is acceptable risk. The hard parts of Sandthrax are still hard and still dangerous, despite the impression that the hardware makes it more accessible for more people. Its not. Sandthrax is a great canyon, an amazing canyon, but it deserves respect. Mike (front) and Eric hike up the sandstone on inclement weather to the head of Sandthrax Canyon. Despite, what is ahead of them, Cody is all smiles with Sandthrax seen in the background. Eric (front) and Mike work near the start of Sandthrax. Eric (left) and Cody in Sandthrax. Eric and Mike working Sandthrax. Mike crosses the major silo. Mike looks on after crossing the silo. 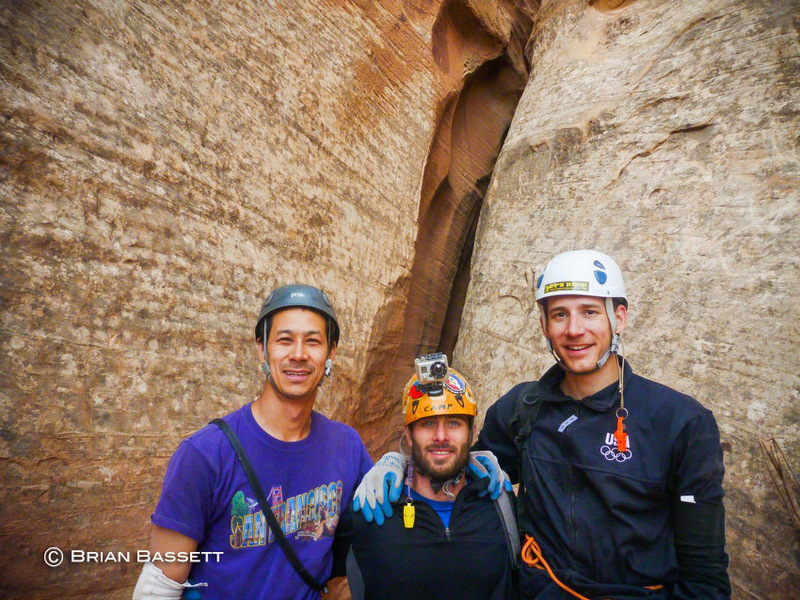 (From left) Mike, Cody and Eric pose for a self-portrait just before the crux. 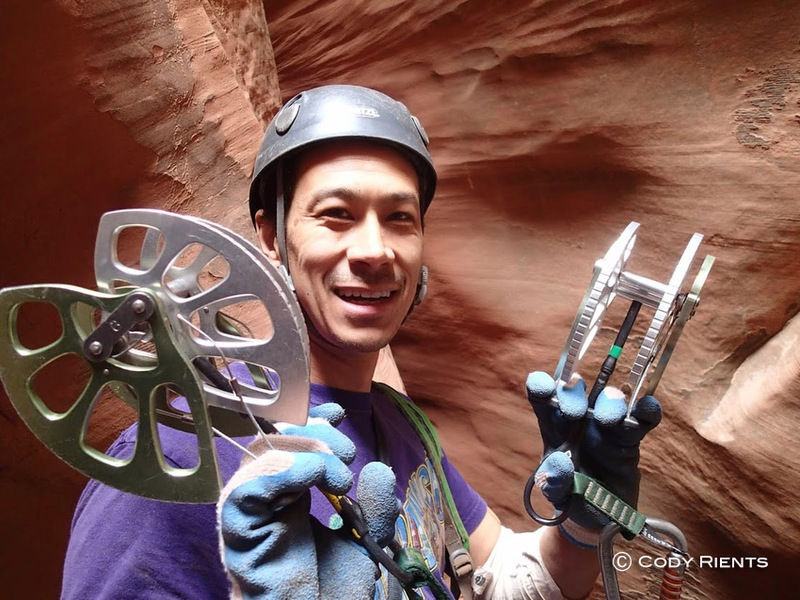 Mike shows off his #6 cams before putting them to use at the crux. Mike begins aiding up the crux. Eric belays Mike on the crux. Eric and Mike take a breather. Cody and Eric up high in Sandthrax. Eric finally on solid ground. (From left) Mike, Eric and Cody, all smiles with Sandthrax behind them. Junk taken out of the canyon.